Frankly, would I have picked this novel up if I hadn’t learnt that this was written by JK Rowling? I don’t know. The cover isn’t eye catching and the blurb sounds like run in the mill. On a cold night famous super model Lula Landry plunges to her death. After initial speculations of murder, the police rule the death as a suicide. But Lula’s brother, John Bristow refuses to accept that his sister, despite all the reports in the media and evidence shown by the police, could commit suicide. He hires a private detective Cormoran Strike, an ex-military man, to investigate the death of his sister. Sounds nothing extraordinary, right? Yeah, but that is where the brilliance of JK Rowling comes in. She takes a story that’s been told so many times and makes it enthralling. The wit and mysterious tone that was so evident in Harry Potter series is back in this book. While reading this book I was reminded of Agatha Christie mysteries. ‘The Cuckoo’s Calling’ has the same tone and feel to it. Cormoran Strike, despite being burly and bear like, reminded me a lot of Hercule Poirot. Like Poirot, Strike too relies mostly on his ‘little grey cells’ and uses methodical investigative skills. Despite his appearance and background Strike oozes a certain vulnerability that I found endearing. His pairing up with Robin (yes, I was reminded of Batman and Robin too), a secretary sent to him by a temp agency, feels like a match made in heaven. Both Strike and Robin are well fleshed out characters. The novel isn’t fast paced or action packed. But the mystery, Strike’s adventures and JK Rowling’s writing are intriguing enough to keep the reader interested. As always JK Rowling’s prose is beautiful and enchanting. The only quandary I have with the novel is its predictability. The ending dint quite surprise me. 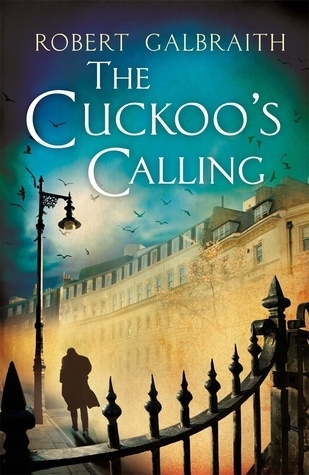 But all in all ‘The Cuckoo’s Calling’ is a really good mystery novel and worth a read. PS- It doesn’t surprise me that JK Rowling decided to write a mystery novel. Firstly I remember an interview of hers where she expressed an interest in writing a murder mystery (that is the reason why I thought ‘The Casual Vacancy’ was a mystery novel). And secondly mystery was an underlying genre in Harry Potter series. Severus Snape’s story arc is one of the best mysteries I have ever read. Sign into Goodreads to see if any of your friends have read The Cuckoo's Calling. So weird you picked that paragraph to share. That was one of the few to jump out at me. I totally agree with Snape's story arc too, thats one of my favourite parts of harry potter. me laughing like hell.....at ur reaction......."
You should join us Srinivas. Stephen wrote: "So weird you picked that paragraph to share. That was one of the few to jump out at me. I totally agree with Snape's story arc too, thats one of my favourite parts of harry potter." It was one of the paragraph to jump out for me too :). just wanted to say - love that first gif!